What options are available to fully customize a hi lo table? 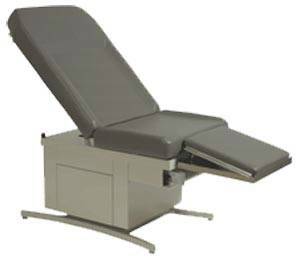 Customization options for hi lo tables will vary based on the specific model, manufacturer, and the needs and requirements of the doctor and medical staff. Common customization options include the upholstery color and style, which can vary from a solid color to more of a patterned or textured appearance. There is a wide range of colors with most companies, many having 10 or more possible color selections. Other options include the location of rails, drawers, and controls which can be to the right or left side of the table. This allows easy access to materials stored in the drawers or cabinets based on the room orientation and set-up. Some hi lo tables also provide the option of having the table on casters for easy mobility or on standard non-skid feet for secure and permanent positioning. Is there storage space under most hi low tables or what options do I have for keeping equipment close to where I need it most? There are many different storage options in hi lo tables. Some models offer one or two drawers that are located under the central portion of the table. These drawers can be designed to be opened from the left or right side of the table or they can be adjusted to open to either side. There are some tables that are designed with cabinet space under the table, typically these are the flat table designs. These cabinets will usually have adjustable shelves and may also include drawers above the cabinets or on one side of the base. Storage space in any hi low table will be limited as the power motor or the hydraulic pump needs to be located within the unit for safety. The scissor type hand crank tables will have no storage as well the medical lift type tables that are open frame design. What are the typical measurements for a standard or bariatric hi low table and is there a great difference between models? Depending on the particular style of table there can be differences in measurements and specifications. Typically, most of these hi lo tables will raise and lower between 19 and 35 inches but some models will drop down to 17 inches. The width of the tables will vary with 27 to 30 inches a typical measurement with the bariatric chairs often wider. Some models of hi low tables are designed to be used more as a chair while others are literally a table. The table lengths vary between 68 and 74 inches with some models up to 80 inches in length with the footrest fully extended and the back in the full horizontal position. Most are not shorter than 54 inches in the complete upright position. Typically, most tables have a weight rate of 350 pounds, with bariatric tables constructed and tested for weights of up to 800 pounds. It is essential to carefully check the weight range of the table before using with bariatric patients for patient and staff safety.